Toyota Motor Corp is ramping up its push on gasoline-electric hybrids, launching a new model in Japan and taking on up-and-coming competitor Hyundai Motor Co in its Korean home market with its flagship Prius. Toyota said on Tuesday it aims to sell 36000 units a year of its new Sai hybrid sedan in Japan, taking another step towards its goal of selling 1 million hybrid vehicles annually worldwide soon after 2010. 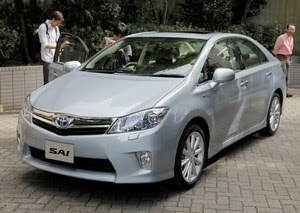 The Sai sedan is the second hybrid-only model under the Toyota brand after the Prius, and is a repackaged version of the Lexus HS250h hybrid, which went on sale in June. Toyota also on Tuesday launched its brand in South Korea, a market dominated by Hyundai and affiliate Kia Motors Co, first with the Prius and Camry hybrids, as well as the RAV4 sports utility vehicle and non-hybrid version of the Camry, its most popular sedan. Hyundai has been grabbing market share globally from Toyota and other major automakers, winning over customers with its line of cheap, fuel efficient models and catchy marketing campaigns. In July, Hyundai unveiled its first hybrid car, which uses liquefied petroleum gas, in the South Korean market and is due to launch its first gasoline-electric hybrid, a version of the flagship Sonata, in the latter half of 2010. Toyota, the world’s biggest automaker, is miles ahead of competitors in the fast-growing hybrid field, which has enjoyed tailwinds especially in Japan thanks to generous subsidies and reduced taxes on cleaner cars. It expects to sell 500,000 to 600,000 hybrid vehicles globally this year, while facing a short-term battery supply bottleneck for anything further. “The introduction of the Toyota brand into South Korea is aimed to meet the diversifying needs of consumers in this growing market,” Toyota Executive Vice President Yukitoshi Funo told a news conference. “We intend to make every effort to contribute to South Korean society and earn a loyal following.” Toyota expects to sell a combined 500 vehicles per month initially, aiming to raise that to a still-modest 700 units beginning in 2010. The Sai, which will go on sale in Japan on Dec. 7, starts at 3,38 million yen ($37290), compared with the Lexus HS250h’s starting price of 3,96 million yen. The Sai has a listed mileage of 23 km/litre (54 mpg), or twice that of a comparable gasoline car, chief engineer Shigeru Nakagawa told a news conference. Toyota said it had no plans to export the Sai, which will be built by unit Toyota Motor Kyushu in southern Japan. Toyota said the Sai concept was derived from a Japanese character meaning talent and coloration.